Communicating with people is one of the biggest functions of a smartphone. There is an almost infinite amount of apps that can be used to communicate in some form. Which ones are the best? 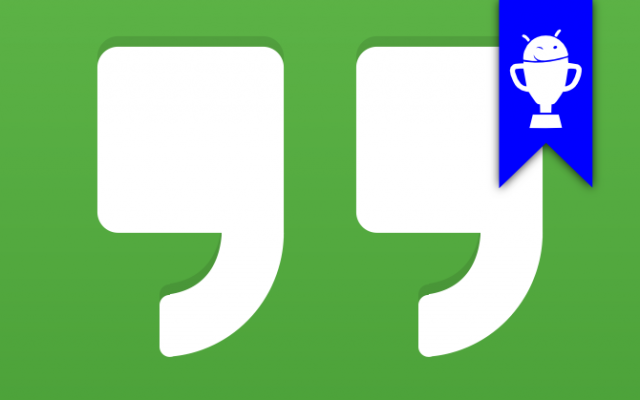 Last week we asked you to tell us which messaging apps you use. These apps could be used for SMS, instant messaging, video chat, or all three. After one full week we have tallied the votes. 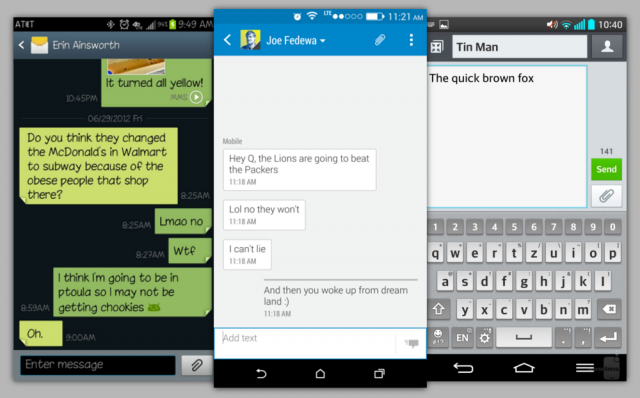 Here are your picks for the Top 5 Messaging Apps for Android. 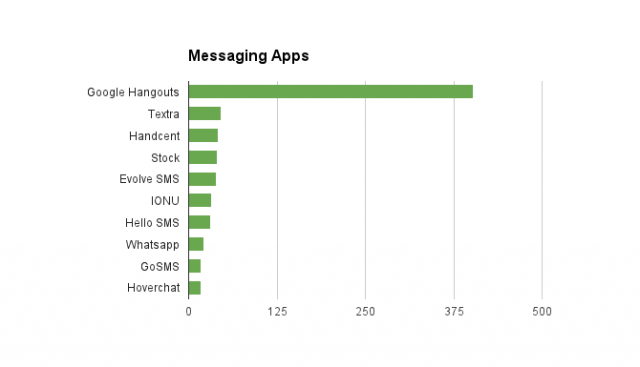 In a landslide victory Google’s own SMS/instant messaging app was your top pick. 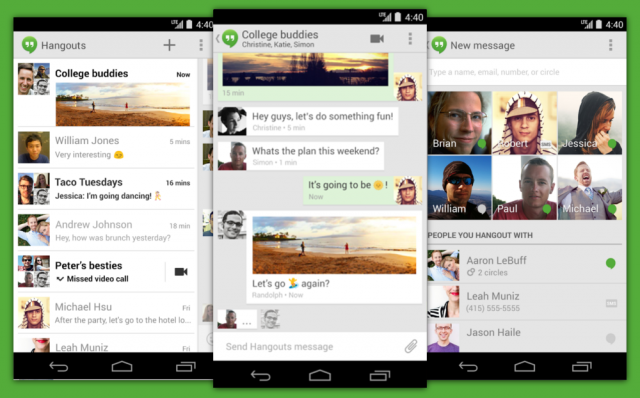 Hangouts started life as Google Chat/Talk, but recently was converted to a proprietary messaging service. In the past year Google has also added the ability to send SMS with Hangouts, and made it the default messaging app on Nexus devices. It can do video chat, voice calls, group chats, send photos, and just about everything else you’d expect. Coming in at second place is Textra, a beautifully simple SMS replacement. 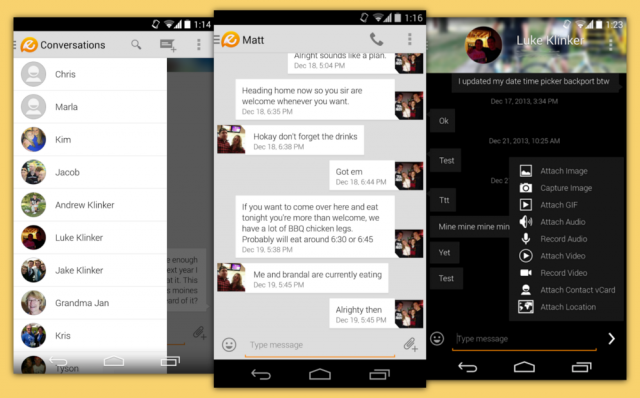 This app aims to be a replacement for the bland SMS apps that come on most Android devices. It has a few different themes to choose from, over 800 emojis, animated GIF support, a quick reply pop-up window, group messaging, and so much more. If you just want something a little more feature-packed than the stock SMS app this is a nice choice. Handcent calls itself the “most popular messaging app on the Android platform.” It has certainly been around for a long time, and apparently people are still using the crap out of it. What Handcent lacks in design it makes up for with features. It has a handy pop-up quick reply windows, Facebook profile photo sync, tons of themes and skins, group chat, cloud backup, and so much more. Sometimes the SMS app that comes on your phone is good enough. Samsung, HTC, LG, and others all have slightly different stock SMS apps. If you don’t do a lot of texting you might not care what it looks like. Apparently a good portion of you fall into this category. There’s nothing wrong with that. Just because you can change the SMS app doesn’t mean you have to. 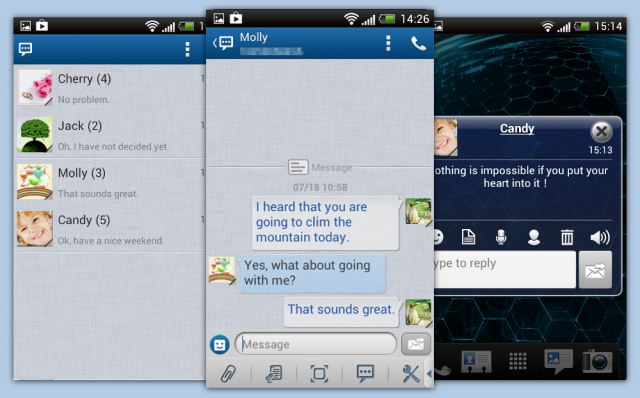 One of the best looking SMS apps available for Android is Evolve SMS. This app fully embraces all of the Android design guidelines, and looks great doing it. The interface allows you to slide easily between conversations, and a pop-up makes it easy to quickly respond. 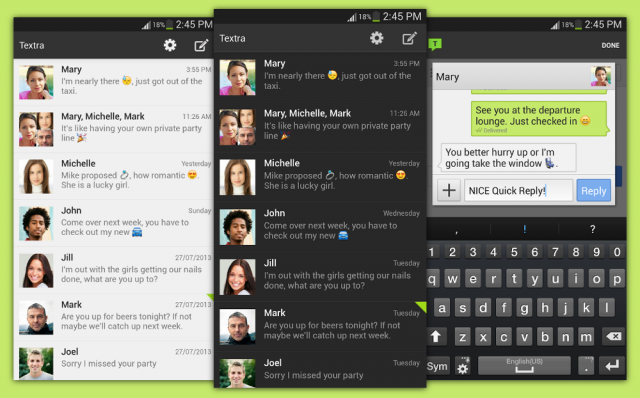 There is group messaging, gestures, widgets, themes, tons of emojis, customizeable notifications, and much more. Those are your picks! Thanks for sharing your favorite apps with us. If you think your pick got snubbed make your case for it in the comments. Check out the chart below to see how the voting went for the top ten apps. We’ll be back next week with another edition of Phan Favs. Don’t miss it!